Arvixe is well known in the web hosting industry for their developer-friendly web hosting packages and having a wide variety of hosting options available to its customers. The ability to upgrade seamlessly with the same company is a huge plus for any business that is looking to expand, and their list of features is impressive. After initial testing of Arvixe I had them down as my #6 web host, but my extended test has gone so smoothly that I have moved them up in my rankings. 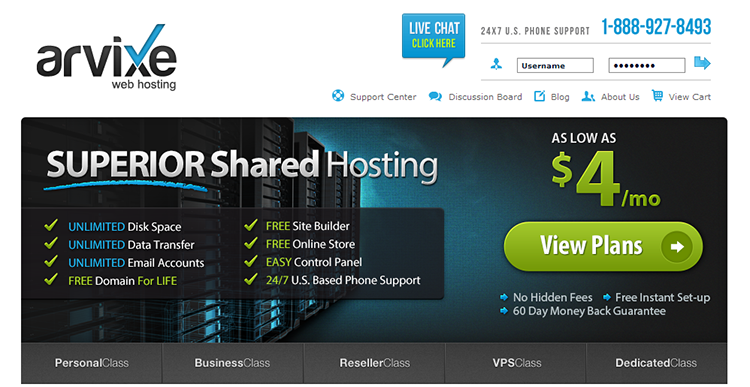 Their uptime, quality of support, and server response time are all outstanding. 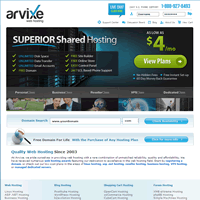 It is no wonder why Arvixe is so highly regarded in the industry, as well as by other web hosting experts. While their basic shared hosting packages are more expensive than their competitors, Arvixe provides service that is worth the extra cost if you are a prospective business hosting customer. They offer a competitive list of features and an above average uptime as well as server response time. It is no surprise that they have been recognized by Inc. Magazine as one of the fastest growing companies in the United States for the past 2 years. Arvixe, along with HostMetro, are the only two hosting companies I have come across that do not increase the renewal prices on their hosting packages. It is a rarity in today’s market because of the high price that affiliates demand for being listed on their websites. While their $4.00/month pricing is a bit higher than other companies, it is understandable because Arvixe offers a free domain name for life. Most other companies only offer the free domain name for 1 year. The Arvixe personal class plan does have one restriction that I don’t much care for. They only allow you to host up to 6 domain names on the account. In order to host more you need to upgrade to the pro account, which is $3/month more, and does not give you any extra features. Other than this, the personal class plan includes all the features you would expect including cPanel control panel, the easy to use RVSiteBuilder, Cloudflare, and more. If you plan on hosting more than 6 websites on a single account, you may be better served elsewhere, but otherwise the personal class plan has every feature a personal or small business website should need. This is the main reason I had to move Arvixe up in my rankings. I have been running a test website on one of their servers for about 5 months now and so far have experienced zero downtime. You read that correct. I have had 100% uptime according to my uptime monitor. I always expect a little bit of server downtime. It is virtually unavoidable on shared hosting services. Someone on the same server as you will eventually have something go wrong with their website causing too much load on the server which could bring it down. The fact that I have had no downtime means one of two things (or possibly both). Either 1. Arvixe has server administrators who are experienced in handling their servers and mitigating issues to ensure uptime or B. They don’t fill their servers up with too many customers. Either way, 100% uptime is fantastic. While the wait times are a bit longer during peak hours, it is to be expected with a company that is growing at such a high rate. The support representatives are responsive and helpful when you do get a hold of them. One of the biggest advantages that Arvixe has is the online forum they offer. Many customers and employees post their problems and resolutions there so that other customers have a place to research if they are having issues of their own. It is a big help to see others going through the steps to fix issues you may be facing. Arvixe is a great option for customers who expect to have their websites grow over time. Arvixe provides everything that you would need to upgrade quickly and seamlessly if you need the ability to service more visitors at a moment’s notice. While a bit pricier than other hosts, their features, reliability, and free domain for life make it less painful to go with Arvixe.